Measure cereals in large microwavable bowl. Line cookie sheet with waxed paper or foil. In 2-cup microwavable measuring cup, microwave butter uncovered on High 30 seconds or until melted. Add marshmallow crème and brown sugar; microwave uncovered on High 30 seconds, or until mixture is heated and can be stirred smooth. Pour over cereal, stirring until evenly coated. Microwave uncovered on High 2 minutes, stirring after 1 minute. Spread on cookie sheet. Top with chocolate candies. Microwave white vanilla baking chips and oil uncovered on High 60 to 90 seconds or until mixture can be stirred smooth; drizzle over top. Sprinkle with jimmies. Cool completely, about 30 minutes or until drizzle is set. 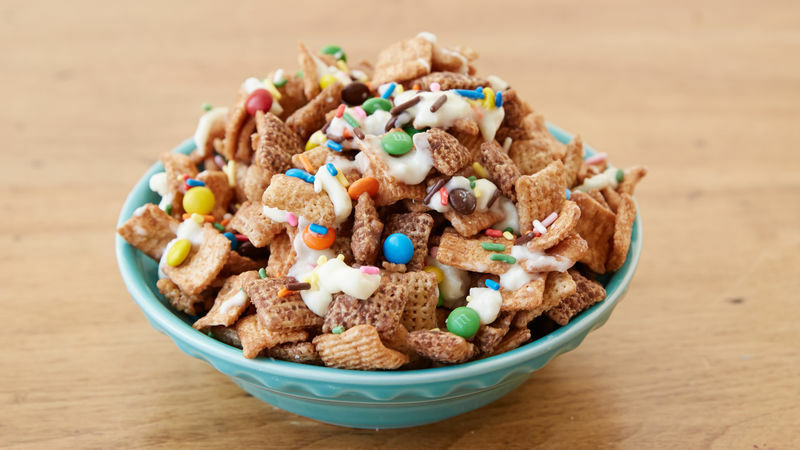 This mix is great for birthday parties, but it can fit into any holiday spread by using holiday sprinkles in place of the jimmies. Try adding your favorite candy in place of the candy-coated chocolate candies.